The Nest at Finch Rest: IT SNOWED! And half our leaves haven't even changed colour yet! I am in the middle of Ohio! This is shocking! Guess there's really no going back now. and have a ton of catching up to do! Can't wait to share lots more asap with you all! It was only raining when I left for work this morning at 5:45. My daughter says there is snow on the ground now, but it's only raining here on campus. Such a change from last week. Oh well - I guess that warm beautiful fall weather we've been enjoying, couldn't last forever. I heard that on the news. Wow, already! It's suppose to be 39 degrees here Friday morning. Guess Fall is about over. Pretty photo's though. Yikes! Our leaves haven't changed yet either and we are expecting snow this week! Already? Hope that doesn't mean a hard winter for you! Last year was pretty bad for all you folks in snow country! Oh my goodness how pretty, a Winter's wonderland ALREADY! I love the first snows of the season, but aren't these a Little too early?! Hope you don't have a hard Winter lovely lady. Weather is crazy every where now, I bet you'll have an Indian Summer next, lol! The pictures are so pretty, but I know you would rather have the fall weather. Hope you don't have a terrible winter. We have had a very warm fall here in SO CA and would love to have some cooler weather but no snow. Stay warm. Beautiful pictures. Aww, that looks so pretty Michele. It's snowing here now but not staying on the ground. I've missed you at Finchrest but know you're busy. We'll be here when you have things under control and come back. How lovely. I found that my snapdragons look like they loved the snow at our house. Very pretty Michelle! Although I read it online in the forecast, I didn't quite believe it until I saw it this morning, Michele! I still couldn't believe it. You'd think we could get past Halloween before this starts! It looks like you got more than we did here. Nothing stuck here. I certainly hope that that was a fluke! It does look pretty for the first five minutes. The first snows are always so pretty. 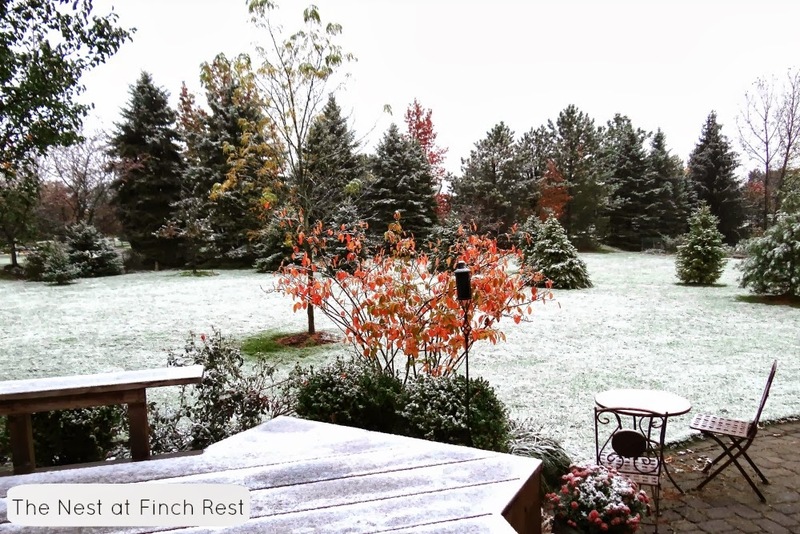 Maybe you'll have snow for Halloween?! We are due to get snow, any time now. Not looking forward to the long winter. I would love if it would snow a week or so before Christmas, and through New Years Day, and then start to warm up **grin**! Sheesh, snow. Half of our trees have not turned yet either ( Western PA ) and I still have flowers blooming. They say we may get some snow showers tomorrow along with rain but you got serious snow !! I love snow...but not quite sure I'm ready for it before Halloween! The pics are beautiful though!! Oh my goodness! From what I understand, it's headed our way, too. The snow does look pretty in your pictures...and cold! Snow makes for a pretty sight, but just keep it up that way. In Texas we seldom get any and I am thankful. Hmmm..... I love snow also, but here in California our temp was 78 degrees this afternoon. Our weather this October has been unseasonably warm and dry - nice to live with but not good for the environment! Thanks for the pictures - at least I can dream while I look at them! Wow, snow was a shock. Guess it's always beautiful even when you least expect it. Our weather in Kansas City was much colder the last couple of days and frost this mornings so I am thankful it was not snow. Take care, keep your mittens handy. 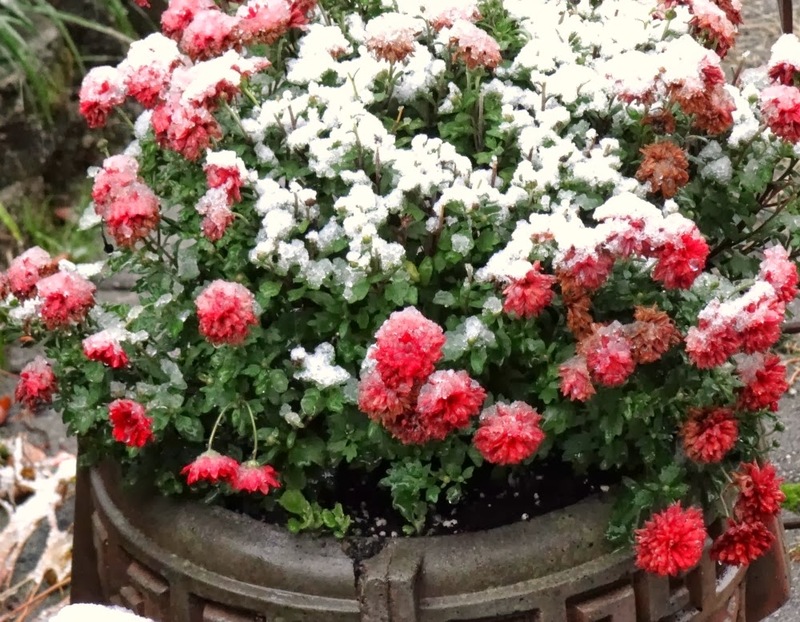 yep, my roses were shocked-- crazy weather! I heard about that snow. Amazing. And your pictures are so pretty! Wow! It looks pretty but I'm glad it's not here on the Island. We will have it long enough without it arriving this early! Your poor flowers! I know you're busy and I want to thank you for joining me at my HOME. We'll all be here when you are ready to join us once again. Hope you have a lovely weekend. Woke up this morning with about the same amount of snow on the ground. Not unusual for us though! 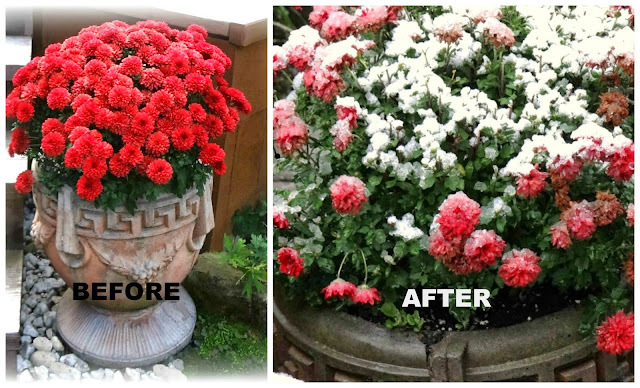 I tossed my beautiful annuals in the compost today as we will have freezing temps all week. As someone who hasn't seen snow so much as dust the ground in two years, I am JEALOUS! They're predicting a very cold winter here, so ... fingers crossed! 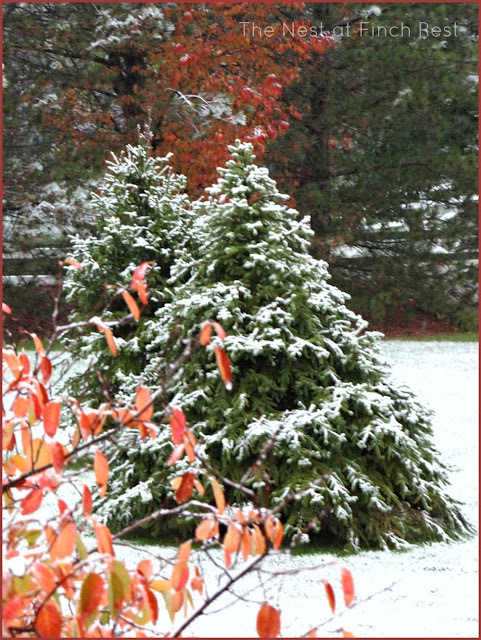 Your backyard is so gorgeous with snow I imagine it is even more stunning in the spring after the melt :) Your blog reflects your creative nature! I love it.